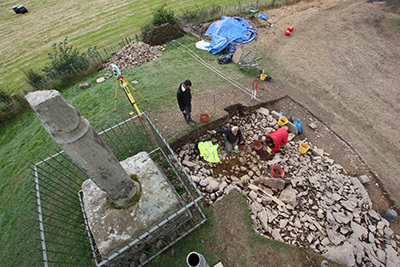 Project Eliseg involved three field seasons (2010–12) of survey and excavation at the multi-period mortuary and commemorative monument known as the Pillar of Eliseg, near Llangollen, Denbighshire, Wales. Each season incorporated an evolving range of media and public engagement activities, with digital media employed to disseminate ongoing work both globally and locally, including to those unable to access the site during the excavation seasons. One of the key strategies employed via digital media in seasons 2 and 3 was a daily video-blog (hereafter: vlog). This article presents and appraises the rationale, design, content and reception of the Project Eliseg vlog revealing key lessons in the use of digital media in archaeological fieldwork, particularly for those engaged with the archaeology of death, burial and commemoration.